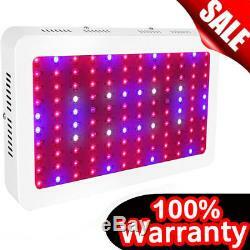 1200W Full Spectrum Hydro LED grow light for medical plants veg and bloom Fruit. LED's Grow light much more light per watt than fluorescent or HID lighting. 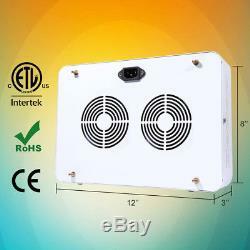 This also means that they run cooler, reducing electricity costs as well as the risk of fire in your grow room. Our LED grow lights come with small fans built in, and do not require additional ventilation except in special circumstances. Another bonus is that they do not require ballasts. Overall, they return much higher yields for lower levels of electricity consumed. 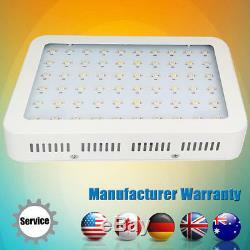 NOTE: Our Glow Light panel made of 120 PCS 10 watt LEDs light Bead. Each LED light bead (double led chip) affordable power is 10W, means the rated power is 10W (rated power is not the actual power). 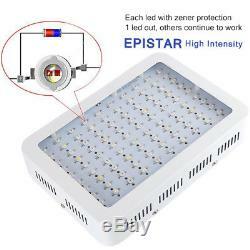 It means that you can use it as a replacement for a 1000W HID or HPS grow light. That's why we declare 10W 120 = 1200W. Actually, consider about the special work circumstances and heat issues, also for the sake of the lamp life longer, energy saving and security concerns. 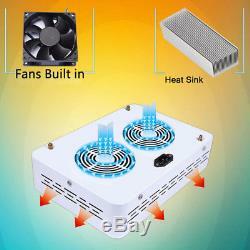 Actual consumption power is about 150W200W. Dimension: 310mm 210mm 60 mm (12.2 inch x 8.26inch x 2.36 inch) LED Type: Epistar LEDs Full spectrum for vegetative and flowering stage: 410nm, 430440nm, 450475nm, 620630nm, 650670nm, White, IR(730nm) It is hard to see the IR lights clearly by eyes, it's very dim. Please don't think they are not working. Instead, it plays a very important role in the flowering and fruiting stages of plants. Coverage Area: about 3.5 x 5.2 ftThe lighting area and the height are changeable according to different plants and environments. Lifespan: >50,000hours Worldwide Voltage: 85v-265v Working Frequency: 5060Hz LED output Power: 1200W (120pcs10w) , Actual consumption power is about 150W200W. Usually LED lights are described in terms of the equivalent wattage you would need in a HID or HPS light to produce the same results. For example, when you see a LED grow light listed as "1000W" it means that you can use it as a replacement for a 1000W grow light, even though the actual wattage may be as little as 140W on the LED. Using tips Lighting Time setup: Vegetative Stage: 12-14 hours on; Flowering Stage: 9-12 hours on. Fruiting Stage: 7- 8 hours on Suggest distance above plants: 1.2-2m Tips for increasing lifespan: please let the light have a rest for about 20mins after 5-6hours working. Our Glow Light panel come with 2 small fans built in. They run at high speed due to fan heat, which will cause noise. Attention Do not use the lights in dripping water or anywhere where they will get wet, water and electricity can be a dangerous mixture. The working environment is -2040? To protect the light, Pls cut off the power when there is a lightning strike. Don't touch or move when the light working. 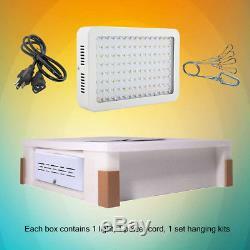 1 x LED grow light Panel 1 x US power cord 1 x Hanging set. We care about our valued buyers, if you have any questions, our Customer Service staffs will be very glad to help you. We try our best to reply to your emails as soon as possible, however, due to high volume of daily incoming emails and time zone difference, we may not be able to reply your emails immediately. About item:For the functional products in our shop (such as: Chargers, Data cables), we make sure that the functions are the same as description, but the actual color and shape may looks a little different from pictures because of the technical improvement and manufacturing variance. The item "1200W LED Grow Light Hydro Full Spectrum Vegs Flower Indoor Plant Lamp Panel" is in sale since Wednesday, July 02, 2014. This item is in the category "Home & Garden\Yard, Garden & Outdoor Living\Gardening Supplies\Hydroponics & Seed Starting\Grow Light Kits". The seller is "univisione" and is located in Hong Kong.